County says closure is to ensure the public’s safety during the construction of Chain of Craters Road. (ABOVE PHOTO) Kalapana, as seen from above. Image grab from video provided by Ena Media Hawaii, courtesy of Blue Hawaiian Helicopters. Full frame view below. The Kalapana Lava Viewing Area, located near the end of Highway 130 in lower Puna, is closed until further notice. Access is limited to area residents. The County of Hawaii Department of Parks and Recreation says the closure is to ensure the public’s safety during the construction of the nearby Chain of Craters Road. 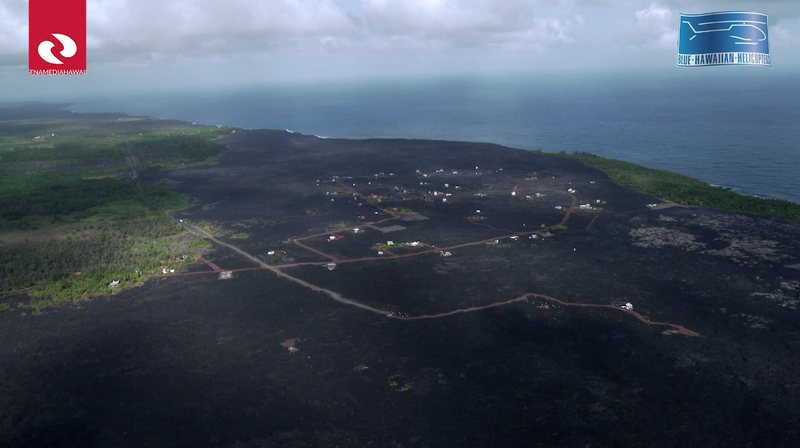 Full frame view of the video showing Kalapana. Image grab from video provided by Ena Media Hawaii, courtesy of Blue Hawaiian Helicopters.